Nation Brand Index - what brand image does your country have? When speaking about marketing, we all know that branding and positioning are important elements. However, who did think about bringing this into the spheres of geopolitics? 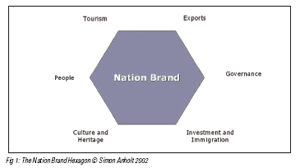 Well Simon Anholt did so since beginning 2005 when he launched a completely new topic: the Nation Brands Index. This index ranks various countries and the image the have upon others in the world. How about explaining the fact that some prefer German cars, Italian design, or French cooking? According to Simon Anholt and the company GMI, together Anholt-GMI, these nation brands are far more important than a Nike or NestlÃ©. It is their vision that with globalisation, "countries compete with each other for the attention, respect and trust of investors, tourists, consumers, donors, immigrants, the media and the governments of other nations." It is thus clear that as a country’s government or organisation it is important to know where you stand. How do you define the branding of a country? Each country will be ranked on these 6 areas and the result is indicated by a hexagon. The country with the highest overall score will become the country with the best branding. But beside the world’s number 1, there is also a winner for each area. The first Nation Brand Index was edited in Q1 2005 with a limited number of countries. In the edition of Q2, this number already rose to 25 and gradually increased during the rest of the year. Recently the Q3 edition of the Nation Brand Index was edited and showed a new approach. This time it where the inhabitants of a country that ranked the other countries. Some of the major results were that for tourism most inhabitants preferred their own country. The main exceptions on this were the Dutch and the Polish. The Dutch, often prefer to go the South of Europe for their holidays, and place their country only on an 8th place. It is indeed rather Dutch to "poorly" appreciate their local aspects. This Q3 report can be downloaded for free - after a simple and free registration. 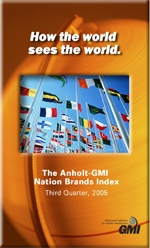 To have a look at the report, simply tick on the link: Report Q3 2005 Anholt-GMI Nation Brand Index. (Link for the NBI-Q2 edition The Q4 edition promises some more features that may interest many. But who are Simon Anholt and GMI? Simon Anholt has had a large international experience with Proctor a Gamble, notably in market research. On his own website Earthspeak.com it says that he’s "regarded as one of the worldâ€™s leading specialists in creating brand strategies for countries, cities and regions". Further on, his biography states that "Simon Anholt advises governments, ministries, civil services and NGOs on the branding aspects of public diplomacy, economic development, public affairs, cultural relations and trade, tourism and export promotion." GMI, founded in 1999, provides e-Business solutions for global market research offering a range of software applications and database services which enable MR firms to conduct global research, either on an ASP basis or via stand-alone Enterprise systems. Accordingly, Net-MR, GMI’s main software product, integrates panel management, project management, mixed-mode data collection, data processing, analysis and reporting into a single solution, enabling their clients to more efficiently conduct market research. Well, you can combine the two and you will end up with the Anholt-GMI Brand Index family. The Olympic Games for 2012 have already been appointed to London, but if the City Brand Index would have existed before, maybe this could have saved Paris from their defeat. 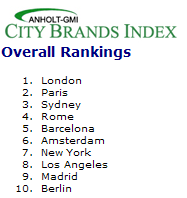 For yes, Anholt-GMI have recently also launched the City Brand Index. What city - out of currently 30 in the world - is the most attractive? The website on the City Brand Index reveals the secrets. To find some more information about this new Brand Index, you can have a look at their press releases. This article has been written by Jacqueline Oud on 22 December 2005.